ANSEONG, Gyeonggi Province -- The late Shin Hae-chul was a spiritual father to many Koreans, healing hearts with songs like “Here I Stand for You,” which was dedicated to the people he loved. Friday marked the third anniversary of the legendary rocker‘s untimely death from medical complications, and people still mourning for him gathered to pay their respects. The memorial service for Shin was held at Utopia Memorial Hall in Anseong, Gyeonggi Province, where Shin’s ashes are kept, attended by family, N.EX.T bandmates, colleagues and his fan club. “For the last two years, I couldn’t finish my sentences when I was interviewed about Shin, bursting into tears. Now it’s been three years, I think I got used to the feeling of sadness. One thing different for this year is that I can finish interviews without crying,” said Jade, one of Shin’s former N.EX.T bandmates who attended the ceremony on Friday, during an interview with media. Friday’s memorial service kicked off with guests pinning on purple ribbons -- purple being Shin’s favorite color -- to show their solidarity, leading into memorial rites attended by his family. 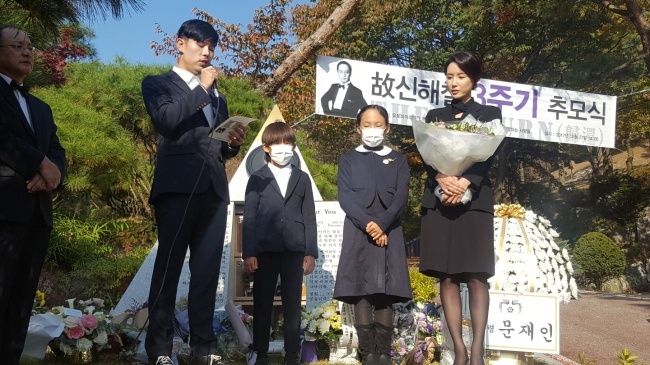 Various events were also held to commemorate Shin at the service, including a choir performance of “The Dream of Freshwater Eel,” Shin’s hit song that he requested to have played at his funeral, as well as a wreath-laying ceremony. Condolence flowers sent by President Moon Jae-in and Kwon Yang-sook, wife of the late president Ro Moo-hyun, were also seen at the memorial hall. Called “The Devil” for his charismatic stage presence and biting social commentary, Shin, who debuted in 1988, was a pioneer of avant-garde rock music here. Also a producer and singer-songwriter, Shin formed N.EX.T. (“New Experiment Team”) and released hits such as “Good-bye Yali,” which later became an anthem for death and grievance. 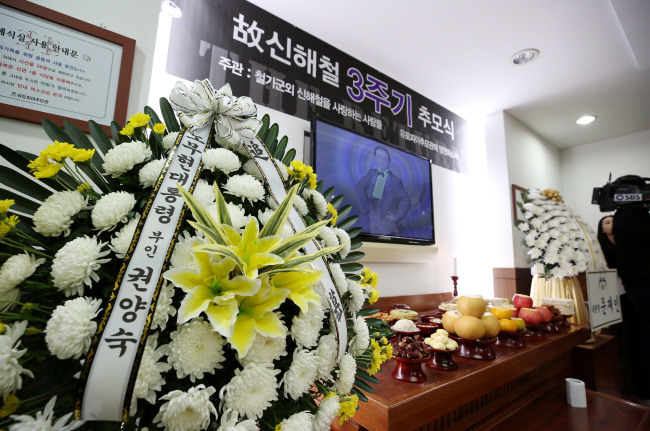 The song was also used by relatives of the victims of the Sewol ferry disaster. The versatile singer hosted radio shows, appeared in hit sitcoms, published books and spoke out on various social issues. A doctor has been found guilty of medical malpractice that led to Shin‘s death. However, the case is still pending as the family has appealed the sentencing. A concert to honor Shin will be held on Nov. 19 under the theme “The Return of the Devil,” featuring his N.EX.T bandmates. Rock bands Eve and Crying Nut and singer Lee Jung are to perform on stage with a hologram display of Shin. A street in memory of the late rock star is also due to be dedicated in December in Seongnam, Gyeonggi Province, where his studio was located. The Seongnam city government initiated the project in May 2016, inspired by a citizen’s proposal via social media. The street will feature a statue of Shin, a monument, an exhibition stand to display his songs and eulogies from his fans. His studio will is also to be open to the public after undergoing renovations.